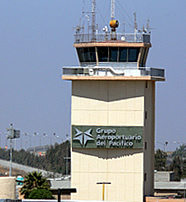 Tijuana Airport (TIJ) is located 6km away from Tijuana City. It is an International airport by classification and a Border airport by type. Its total surface area is 380.03 hectares and it is 152 meters above sea level. It has a single runway which is hydraulic and measures 3.960 X 44 meters. The airport’s terminal zone has a capacity of 1155 passengers/hour and the total surface area of the terminal zone is 16,165m². There are two lounges at Tijuana Airport and they are the Aeromexico Salon Premier and the VIP Room. The two lounges are located in Concourse A – Floor Level and in the Main Terminal – Upper Level respectively. The hours of use for both lounges are as from 7am to 10pm. While there are no hotels within the airport, there are some good ones nearby for those who don’t fancy sleeping in Arrivals or Departures. The closest hotel to the airport is the Hotel de Principado while the Marriott Hotel is 20 minutes away. A shuttle service is available to take visitors to these hotels at a fee. Within the airport are two bureaux de change facilities i.e. the MPA and the Aerocambio. These operate as from 7am to 10pm. Tijuana Airport has three ATM outlets as provided by HSBC, Bancomer and Banamex. At the Arrivals and Departures area you will find a number of different car rental companies including National, Alamo, Thrifty, Avis, Hertz, Budget, Europcar and Dollar. The airport taxis and buses are also accessed at the Arrivals and Departures area. To get your tummy full you will have to go to the Main Terminal whereby you will find restaurants and cafes at Concourses A and B, and on the Upper Level. These facilities remain open 24hrs every day.